What a wonderful month it’s been! 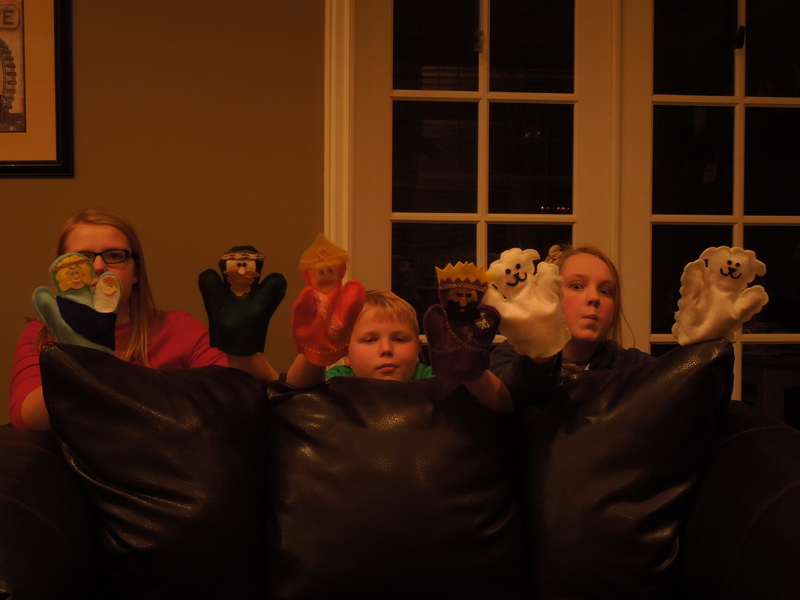 My parents came over for dinner, and we acted out the Christmas story with puppets. We gave our presents to Grandma and Grandpa, and who knew? The necklace hanger also works as a moustache. 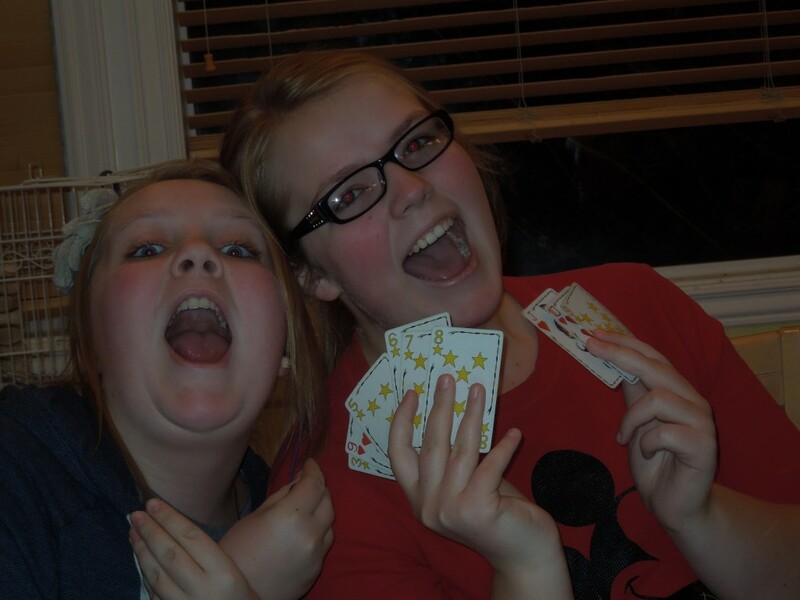 Games were played, there was a lot of laughing. Even before I broke out the Hillbilly teeth and tried to get a picture. On Christmas, after all the gifts were opened and played with, we got the wonderful present of getting to see and talk to our Missionary. He looks and sounds about the same, which is comforting. 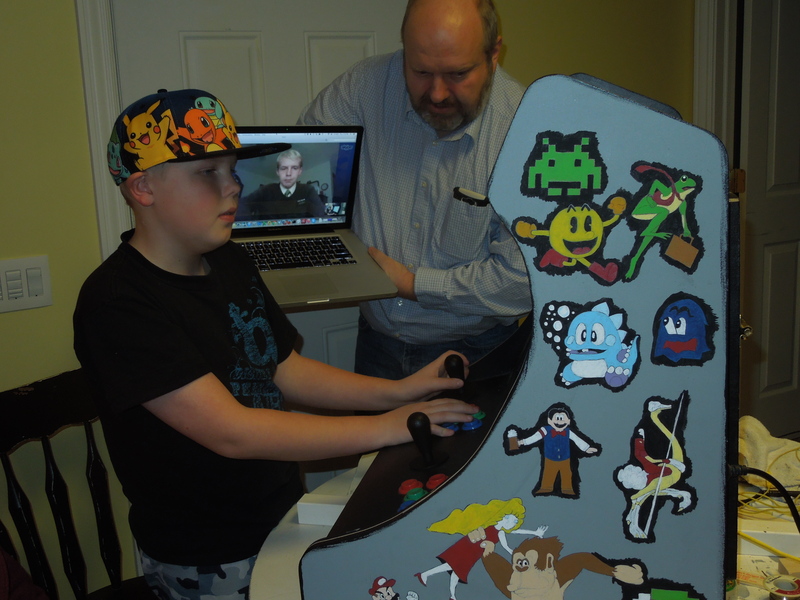 We even had to take him downstairs and show him the cool arcade game that Ryan built and Megan has been painting. He’s still a geek, just like his dad. My heart is full, for these are my greatest treasures. Merry Christmas. I hope you also had a wonderful day with those that you love, and that you remember Jesus Christ in all your Christmas celebrations. When I was a missionary in Germany for my first Christmas, I had only been in the country about a month, and I was trying to be the best missionary I could be. I decided that calling home on Christmas might make me too homesick, so I wrote to my parents and told them my decision to not call home for Christmas. Selfish, stupid girl. That Christmas was the worst Christmas of my life. Not only was I far from home for the first time ever, but my companion and I were living in a small trailer parked at a member’s home. There had been such a large influx of missionaries all at once that they had trouble finding enough apartments, so this was the best they could do for a time. It was cold and damp. We had to go inside the members’ house to use the bathroom and kitchen. We would cook our little rice and sauce and maybe corn and eat there in the kitchen when the family wasn’t using the kitchen, and then go back to the cold trailer. We tried to stay out of the way of the family. I was excited to be in Germany for Christmas, so I tried to keep a good attitude. On Christmas eve, which is the big holiday in Germany, we didn’t have any appointments. No one from the ward had invited us over for dinner, and the host family didn’t invite us to join them. We tracted and street contacted for as long as we could on Christmas eve, but when all the shops closed and the people went home, there was not much more we could do. We went to the bus stop to go home. Oh, busses don’t run on the regular schedule on Christmas eve. When we finally got home, we were tired and dejected. We went inside the house and cooked our little packaged meal, it was probably rice and Maagi sauce, and my companion asked if she could use the phone to call her family. I sat by as she talked to her family and tried not to cry. The family had all gathered in the living room and they did not invite us to join them. We walked by and said Merry Christmas to them and tried to stay out of their way. They were not trying to be hurtful, but they did not want us there. They had offered to let the missionaries stay in their trailer, but had assumed that it would only be for a few weeks. They wanted their married daughter and son to be able to stay in the trailer for Christmas, and were therefore not pleased that we were still there. I was very sorry that I had told my parents I would not call. And I didn’t think I could just call them without having it arranged and having not bought a phone card or anything. Oh, I was so stupid. Never once did I think how much that phone call meant to my mom. I was only thinking of myself at the time, trying to be a good missionary. And since our communication took about 10-12 days for a letter to get home, they didn’t have the time to dispute my decision. How stupid I was. Yes, I survived without that phone call home, but at what cost? My family didn’t get to hear from me, and I didn’t get the boost of calling and hearing that they loved me. Instead, I went back to that silly trailer and cried. As the mother of a missionary, I now realize how important that phone call is. We want to make sure our child is happy and healthy and being treated right for Christmas. Back to the story in Germany, that night we had to call in to our District leader and check in, as we did each evening. I guess he asked how our Christmas Eve was and my companion told him it was pretty bleak. The next day, on Christmas day, I think we might have had a lunch appointment. When we saw the Elders they told us that they had had two appointments the night before and two for Christmas day. They were so stuffed and full, they could barely move. We felt very sorry for ourselves. I guess everyone in the ward had assumed we would be spending the holidays with the family where we were staying, and so they hadn’t bothered to invite us. Since we were new and didn’t know very many members, we didn’t invite ourselves anywhere. In our letters to the president that week we probably both sounded pitiful. 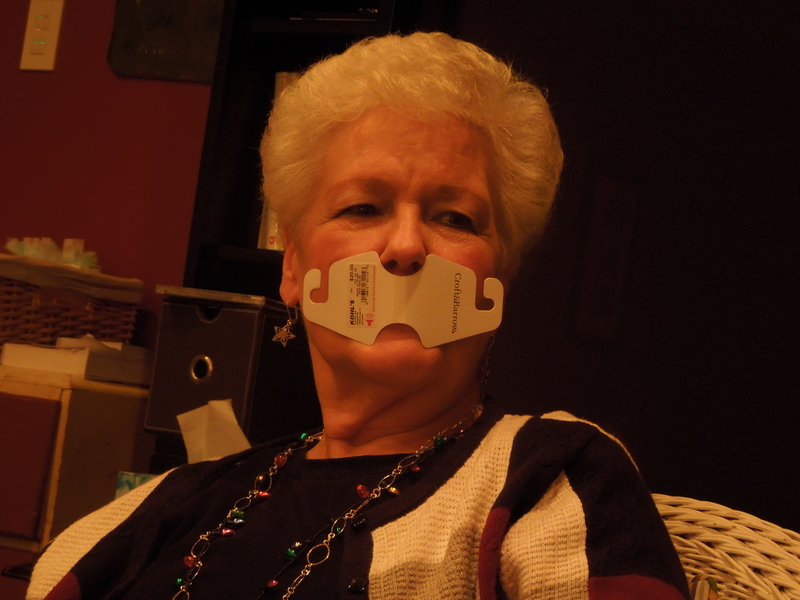 Christmas for us had not been a joyous experience. We celebrated our Saviour’s birth in private, with scripture reading and prayer. But a few days later, we got a call from the mission president. He said, “Sisters, pack your things. You’ll be staying with us in the mission home until we can get this sorted out.” We felt like we were being sent to the principal’s office. We had no idea what was going on, why we were being pulled out of the trailer. We did not know that the family had called the president in anger and asked why the sister missionaries were still there. No wonder we weren’t invited in to the family celebration. They wanted that space for their family. I try to not harbor ill feelings toward that family. They tried to offer up a space for the missionaries, but it didn’t work for them. I don’t think they were trying to make us feel unwanted. 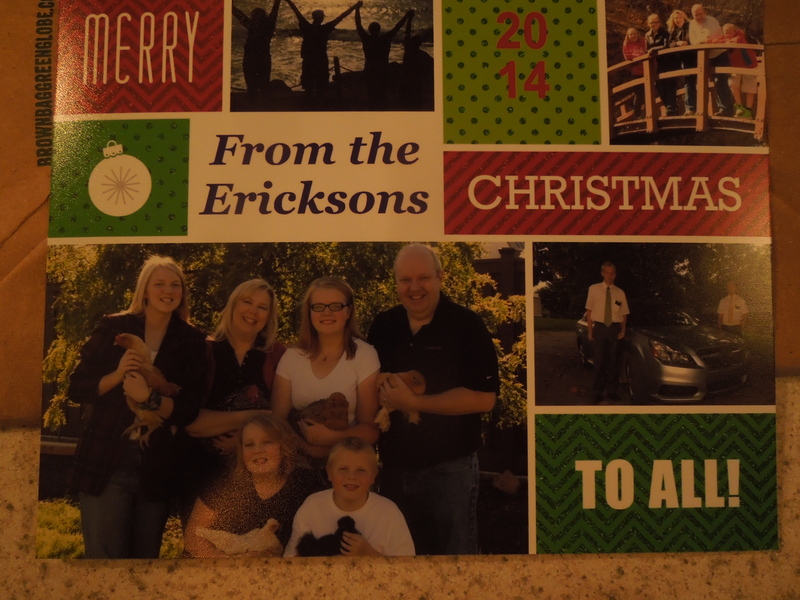 But, no, we don’t send Christmas cards or keep in touch or anything. For the next three weeks, the two of us lived in the president’s home. We still traveled to our area to try to do missionary work, but at the end of the day we would take the train back to Duessldorf to stay with the president and his family. Even though it was a bit awkward, we felt welcome there. We even were allowed to use the kitchen and bake. we still felt loved. 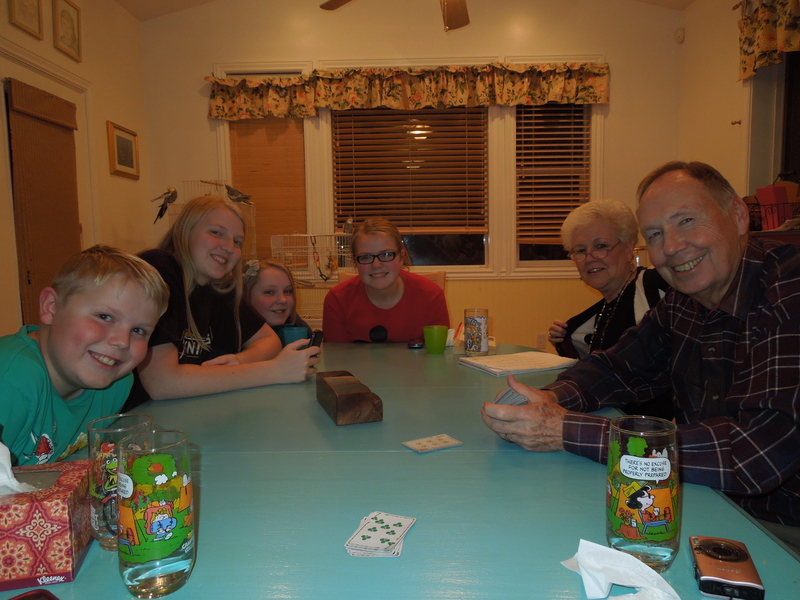 We forged a special friendship with our mission president and his family, and got to experience living in the mission home, which not very many missionaries get to do. In January, they found us an apartment in Essen. A nice apartment, by missionary standards. It had previously housed a missionary couple, above a member’s house. I was only there about three weeks before being transferred. That Christmas was one of those “builds character” experiences for me. When I had my second Christmas in Germany, it was SO much more fun, with member appointments and presents AND a phone call home. I’m glad I got to experience it both ways. 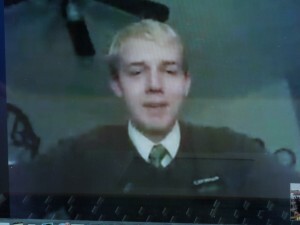 As I get to skype with my son this Christmas, I feel so lucky. So blessed to know that he is taken care of, that his ward gave all the missionaries a big box of food and presents. 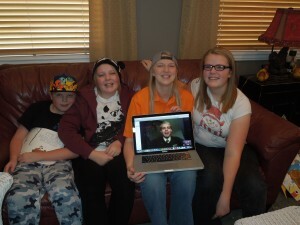 I know that he is working hard on his mission and that I get to call him and tell him how much I love him. Merry Christmas to all of you missionary families out there. Back at the beginning of November, I started a healthy holiday challenge with a group. We had over 30 people sign up to join. Of course, not all of them have stuck with it, but it’s been a good experience for me. I’ve done these challenges before, and I always start out with good intentions and then get all lazy. But, if I were the one RUNNING the group, I would Have to stick with it, right? Right. It’s been 7 weeks. I’ve lost 10 pounds. Who would think I could actually lose weight between Halloween and Christmas? Crazy, right? And while I’m not down to the next size or anything, I can feel the difference in some of my clothes. You see, even within the same size of clothes, there are the clothes that fit and are comfortable (I wear those ones all the time, like the jeans that I have worn through the thighs and really should throw away, but instead I tried to repair them), then the clothes that I could wear, but they aren’t super comfortable. And then there are the clothes that just laugh at me because even though they are in “my size” we really know that they AREN’T my size, and I’m not going to be able to wear them until I’ve lost WAY more weight than I have. They mock me. Really not nice, clothes. The other day I was looking for some jeans to wear, and I pulled out a pair of jeans that I haven’t seen for quite some time. Oh, I loved these jeans. I wonder why I haven’t been wearing them. I put them on. Pretty tight, still. Oh, yeah, I remember. I grew too fat for them. Well, a couple weeks later I put them on, and while they are still tight, they are a little less tight. I had one friend comment that I looked skinnier and asked if I had lost weight. Why, yes, I have, I told her. It’s GREAT to be able to say that and not be just fibbing. There are some super annoying over achievers in this challenge, too. They have to get EVERY point and eat ALL the vegetables and lost TONS of weight, even though they are really skinny to start with. That’s ok, though. I can deal with a little annoyingness because it is helping to motivate me. Today, I trudged through my treadmill time and really hated every minute of it, but I did it. I’m hoping we can buy a stationary bike after Christmas. I’ve discovered that I have foot issues and when I walk for 30-45 minutes on the treadmill, my heel hurts all day. I think a bike would be less stress on the feet and I hope that I would use it more. We have two weeks to go in this challenge, and then the winners will get the cash or a prize. I haven’t totally figured out how many winners there will be, but at least one for the points, and one for weight loss. The points are SO close, though, we may have to break it into smaller amounts and give out more prizes. We’ll see. It’s been a positive thing, and I’m SO glad I followed through with my thought to start this group. Wow! I think we’ve come to the end of the concerts for Christmas this year. It’s such a busy time of year for me with bells that I often miss school things that are going on. Usually if I can’t go, Ryan can go, but last night Ryan was my date to the MoTab Christmas dinner at the Grand America Hotel (our fancy date night of the year), so neither of us could go to Natalie’s choir concert. Luckily we had Megan here, and she could drive Natalie to school. She and Jenna attended the concert, as well as Grandma and Grandpa. Jenna’s choir concert I also missed, but Ryan was able to go. Things just get so busy! 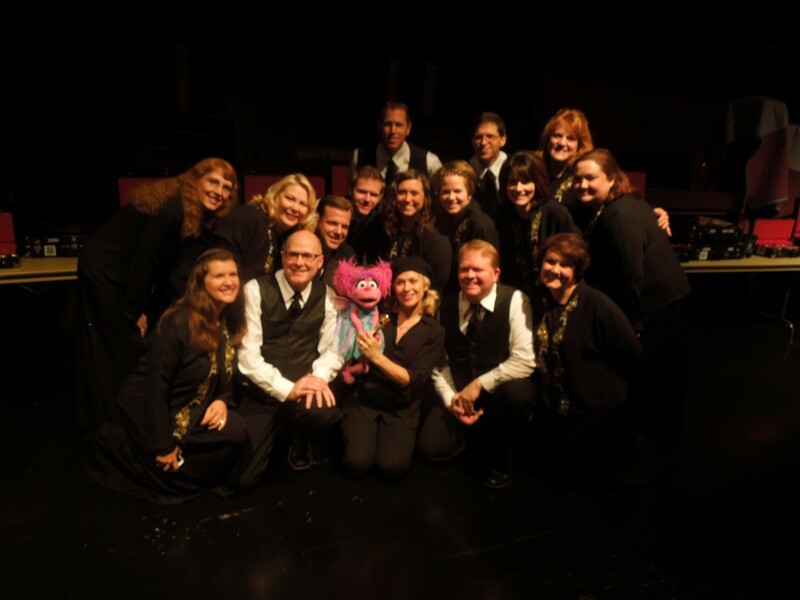 I had a wonderful time with the MoTab Christmas concert weekend. Where else am I going to be able to meet muppets and their handlers? It’s an experience I will never forget. 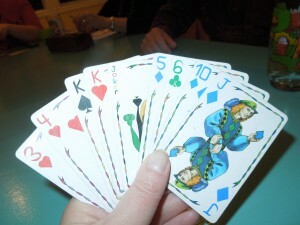 I have been quite a slacker over here on this lonely blog. I’ve been in kind of a funk lately. Just feeling a little bit down. A little bit sorry for myself. Not sure why and I’m not sure how to get out of it. It’s weird because I’ve been exercising and trying to eat right, too. Maybe that’s it. I miss my sugary treats. But I feel cheated when I do what I’m supposed to do all day, I go to bed hungry at night, even hearing my tummy rumble. But when that happens, I think to myself, ‘It’s ok. I’ll see a difference on the scale in the morning,’ only to wake up and weigh and see that I’ve gained half a pound. That’s not fair at all. 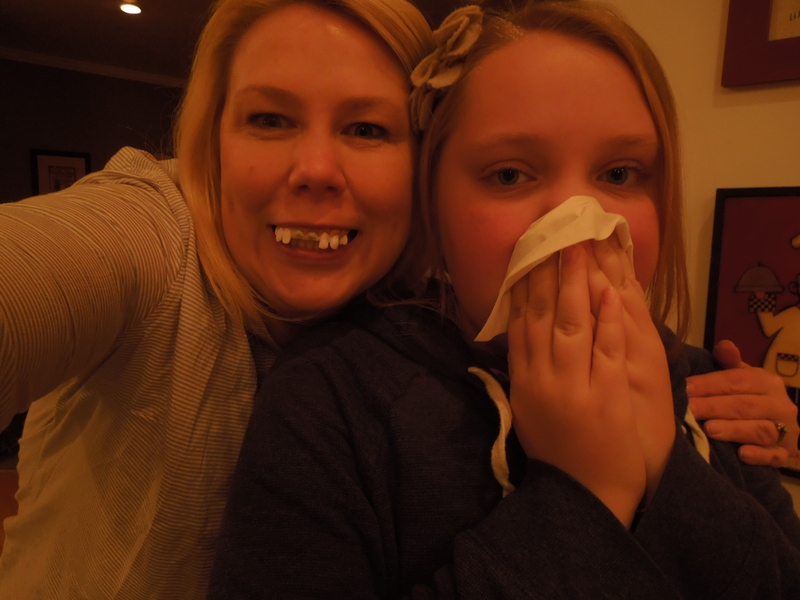 My daughter has a blog and she writes about the sad in her life. It’s depressing to read. I cry for her hurting, then I call her and she tells me she’s FINE, that it helps her to write, to get things out of her head. But still I worry. I want her to meet new friends. I want her to have a fun college experience. I want her to be happy. She’s so different from me, yet I understand her (well, sometimes). I was an insecure teen, too. I wrote many a depressing journal entry, trying to make sense of the world and my roll in it. Trying to find my way, wondering why I kept auditioning for things and not getting the role. I always kind of figured if I weren’t so fat, I would maybe get those roles. Or if I wasn’t so fat, maybe that boy I liked would pay some attention to me. I seemed to blame all the bad things that happened–all the disappointments, all the failures–on the fact that I was overweight. Poor fat cells, having to shoulder all the blame. What do thin, beautiful people blame for their failures? They must have something they don’t like about themselves that they blame for the things that don’t go perfectly in their lives. The other day I got the sweetest comment on facebook. I had written that if I taught Kindergarten full time I would probably be a lot skinnier. No time to eat and constantly on the move. My friend and neighbor wrote, No one cares abt skinny. You are beautiful and talented and funny and sweet and giving. If you were also skinny, we would have to hate you. I don’t know, it might be nice to be hated, just a little bit. It made me laugh. And almost cry. I really have the most awesome people in my life. Instead of dwelling on the blues, I’ll tell you about the GREAT things in my life, my reasons to smile. *Thanksgiving was GREAT. I love getting together with cousins and aunts and uncles that I don’t see often and catching up. My brother and his family also stayed with us Thursday night and Friday night. It was wonderful having them here from Arizona. *Our Bells concerts went SO WELL. We had two concerts on Friday and Saturday before Thanksgiving. The hall was full, the music was great, the spirit was there. It was SO fulfilling to play all those songs that we had been working on for so long. My friend Janeen and I even stayed overnight in a hotel in Salt Lake Saturday night so that we wouldn’t have to do the whole drive home and then turn around and drive back thing on Sunday morning for Music and the Spoken word. *Christmas preparations are in full swing. I’m picking out presents, got the tree up, and am on to decorating the house. *My little chimes choir is doing quite well. They will play for our ward party on Saturday, then have the school concerts on Monday, and then they are done for the season. We’ll get a few weeks off for Christmas break (hooray for not having to be at the school by 7 am!) and then we’ll start up in January and get right into things with two basketball games to perform the National Anthem. One of them, when I was explaining things said, “Why do we have so many performances?” That made me laugh. So, I’m going to get working on decorating my house for my favorite thing ever….Christmas. And I’m going to be thankful for everything I can think of. And I’m going to tell people thank you, and write some thank you notes and maybe do some service. Because I don’t want a blue Christmas. (edited)…..Doing much better. Ward party great success. And PMS. Hmm. Who knew?